May’s monthly Labor Report headlined a seasonally adjusted job gain of about 70K, less than half of the 150K expected. The stock market response was swift and worsened as the day’s trading progressed. By the time the dust cleared Friday evening, the broader S&P500 index had lost about 2.5%, it’s worst daily performance since Oct. 3, 2011. Remember, the headline numbers are seasonally adjusted. For the past three years, market watchers and economists have been warning about the seasonal adjustment factors used by the Labor Dept. The severe job losses in the fall and winter of 2008/2009 have probably skewed the adjustment factors, leading the Labor Dept to overstate job gains during the winter and understate job gains in the spring and summer months. The unusually warm winter of 2011/2012 further skewed job gains, pushing some normal spring hiring forward into the winter months. That’s why I look at year over year gains in unseasonally adjusted numbers, particularly in the core work force aged 25 – 54. Below is a graph of the percent gains of the core work force, which accounts for about 2/3 of the total work force. 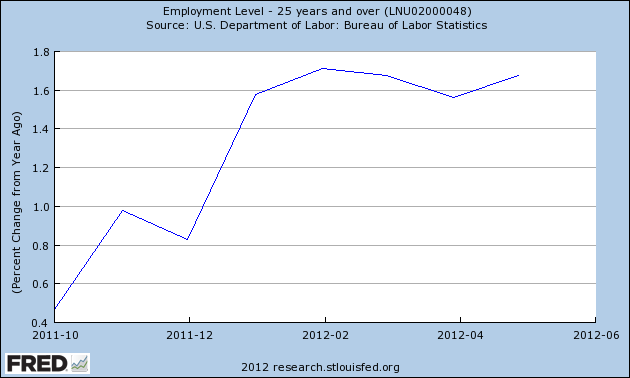 The FED has conveniently saved me the trouble of running the graphs from the Labor Dept – but mine are more colorful :-). The headline numbers of monthly job gains of more than 200K led many investors to bid up stock prices a bit more than the job gains in the core work force warranted. Friday’s stock market reaction was probably a bit much but many investors simply bailed. 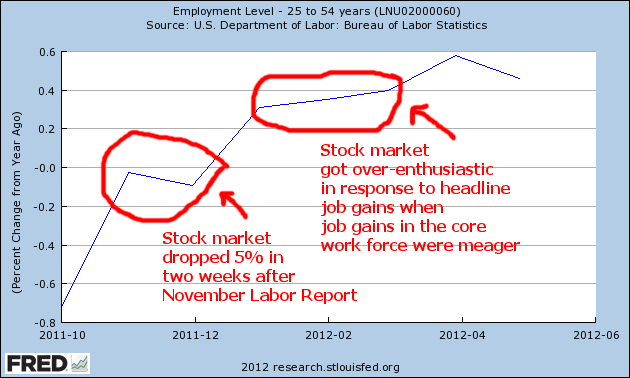 The same stock price and labor market patterns of 2010 and 2011 are emerging again this year. Last June, I wrote about a backtest of investing based on the old “Sell In May and Go Away” mantra. While that investment strategy underperformed regular monthly investing, it has been disturbingly profitable for the past two years and looks to repeat again this year. The disappointing labor figures only compounded the worries about the ongoing recession and financial woes in Europe, causing many to bail out of the market. Let’s “zoom out” on the core work force, looking at the past year and a half. There is a definite positive trend in place. 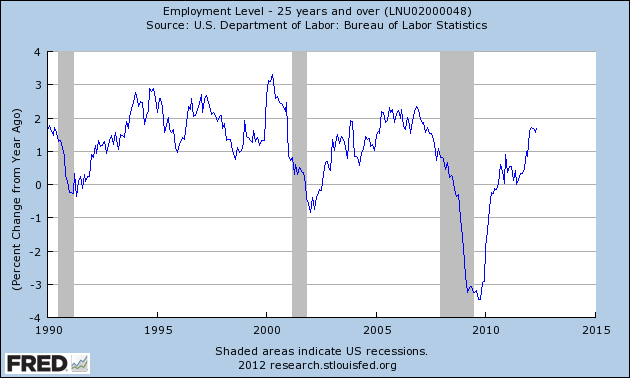 Let’s fly up like little birdies and look at the core work force for the past 12 years to see this recent upward trend in perspective. 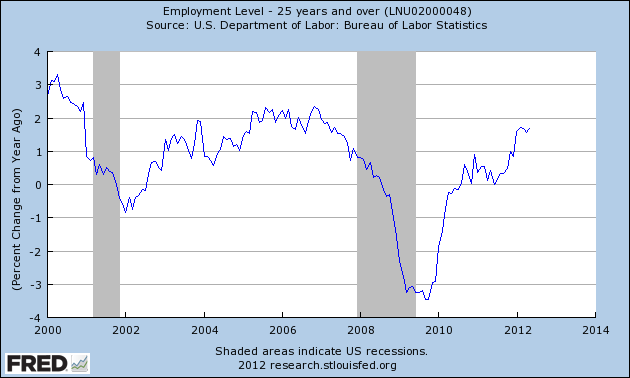 Let’s look at the larger work force, those aged 25+, which accounts for 88% of employment in this country. The year over year gains have leveled off at about 1.6% in the past few months. Looking back the past 12 years, we see that this gain is moderately healthy. 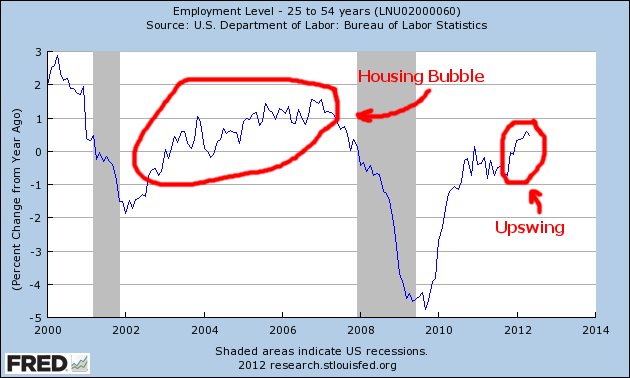 The housing bubble produced employment gains of over 2% – gains concentrated in construction. Now let’s look back to the “roaring nineties,” before China joined the WTO in 2001, leading to a loss of 4 million manufacturing jobs in this country. The country enjoyed a tech boom in that decade, eventually leading to the dot-com bubble as we approached the millennium mark. The job gains these past 6 – 8 months are respectable, averaging what they were in the nineties; core work force numbers are still growing. 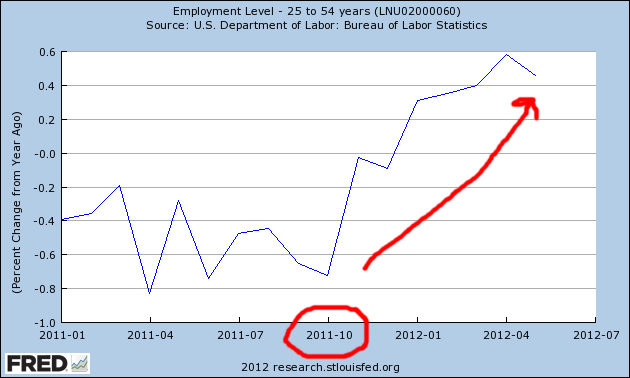 The job losses of this past recession were historic. Most of the 8.13 million jobs lost happened before Obama took office and the job losses were staggering when compared to other recessions. The 1982-84 recession, for comparison, suffered total job losses of 2.84 million, about a third of the job losses of this past recession. 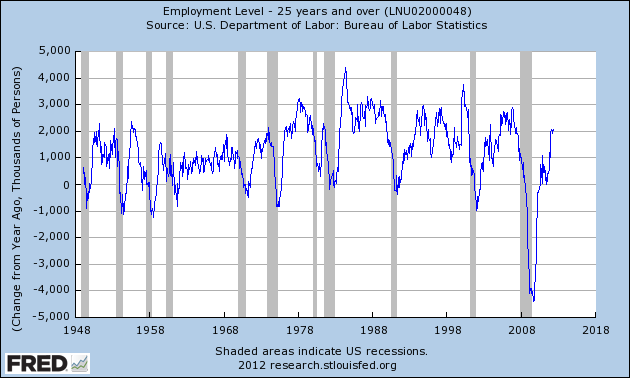 Below is a graph of the year over change in employment levels since 1948. This past recession makes all the past recessions look like small wrinkles. Job losses of this size severely weakened the structure of our economy. The employment growth of the past few years has been respectable, even more so given the deep hole our economy is climbing out of. We are a people who have become accustomed to instant gratification. We want change and we want it now, dammit. The political and media machines of both parties know this and play to it. George Bush played to it in the 2000 campaign, promising to bring the parties closer together, only to drive them further apart. Obama played to it in his 2008 run for the White House, promising to usher in a new era of honest and accessible government, of community of government and the middle classes, where everyone enjoyed a more even playing field. Romney’s run for the Presidency will highlight his business experience, promising unspecified growth policies. What all of these people and their advisors know is that the American public is a sucker for change, reaching for the brass ring of change as we whirl around on the political merry-go-round. We can be easily lied to because we trust our guts, not our brains. If we trust someone or agree with their ideology, we will believe almost any data they throw at us. Most of us don’t check the data. We’re too busy for that or we don’t know how to check the data. It all becomes a blur of he said this and the other guy said that and we get confused and vote with our guts. The parties play to our prejudices. Think you don’t have any? Think again. This election season we will hear a lot of claims, accusations and refutations. Moderators of the upcoming Presidential debates rarely challenge a candidate with data. The moderators ask policy questions; the candidate responds with mostly rehearsed answers. Then on to the next question. It is up to us to do our homework but most of us won’t. Too many of us may be like the caller to a talk show recently. When confronted with government statistics that refuted the caller’s opinion, he responded “That can’t be right” and countered that the government data is wrong. We do love our opinions and that is the number one prejudice we all share.